The contract to build the service area was won by BP, who until recently leased the main facilities out to First. Euro Garages (who, at the time, specialised in taking over unpopular petrol stations) took over the petrol station and then took over the whole site. The services went out to tender in 1967, requesting at least £200,000 be invested, and it was opened in phases. Kenning Motor Group made the only offer to build it and it was initially rejected. Planners were expected to take advantage of the views over Rivington and Winter Hill - it is an open and exposed site allowing for a large complex. It had a single-storey low-level design, to minimise the impact on the valley it is built in. 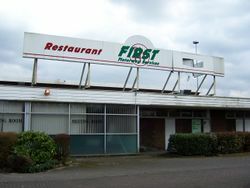 It opened in 1971 under the name Rivington services. A 1974 Ordnance Survey map shows the services with only a northbound amenity building, suggesting southbound visitors had to walk across the footbridge. This is the only evidence to suggest the northbound building was the older one of the two found so far. Inside, the large building began with a foyer area with tables, and a game arcade was added on the right. There was a shop on the left and, on the northbound side, a corridor to the Travelodge reception. Straight ahead was the restaurant servery, refreshment bar and a corridor to the toilets was on the right. The rest of the building contained the kitchen. The original restaurant had large windows and an orange and brown décor, with long rows of benches for seats. It was open 07:00 until 22:00. Kenning Motor Group were leased the services by BP, and sold it to Pavilion. At some point the site's name was changed to Bolton West and it became, quite simply, appalling. By the end of its life there was little care for any aspect of it, and its rating on this site was an average of 1.1 out of 5. The majority of it was falling apart, and the few staff left were reported to have a number of safety concerns. Granada wanted to take over Pavilion were told they couldn't own Bolton West and nearby Birch. A Granada management buyout saw Bolton West pass to First. With its large building and low traffic levels, it wasn't a great site to inherit. On the 23rd July 2010 there was a fire at the garage on the southbound services which meant there was no fuel available for a period, and further facilities had to be provided by portacabins. As Bolton West its main claim to fame is that it starred in Peter Kay's pilot episode for his sketch show 'That Peter Kay Thing' in the early 2000s. The show was a 22-minute mockumentary titled 'At the Services' which took a look at a typical day at Bolton West, including manager Pearl Harbour's quest to impress a celebrity. It's clsimed they filmed here because they were the only services to let him, but it seems to be quite a coincidence that most of Peter Kay's films are made in or around the Bolton area. This was revisited in 2016. In 2011 the site was sold to Euro Garages. In their biggest project at the time, they demolished the whole place and replaced it with something smaller, more manageable, brighter and with more franchised facilities. The motel survived but lost its direct connection to the amenity building. Instead it changed from a Travelodge to Rivington Lodge, with a couple of First-branded signs still inside if you know where to look. 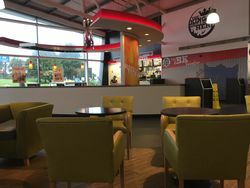 While the new service area may not have the same interesting history: it is a typical modern building occupying a very large concrete area, it has at least improved visitor satisfaction dramatically. In 2000 the services were rated by The AA, who graded it as 'very poor', criticising poor signposting, a lack of outdoor facilities and unclean toilets. Woolley Edge fared even worse. In 1986, Which? Magazine rated the services as "average", saying they felt they had walked "into a time warp", with its "drab colours". In 1977, Egon Ronay rated the services as "poor". It was "cheerful and bright", and "the atmosphere was pleasant even if the food was not". He wasn't impressed by the use of convenience foods.